Prints or Paintings | Art Collecting On a Budget | Skinner Inc.
“Print” is a broad term that, in the context of fine art, refers to a work for which the artist creates the printing matrix, such as an etched plate, a lithographic stone, or a carved woodblock, and uses this to create multiple impressions of an image. The artist may or may not be the actual printer, but generally approves of the quality and methodology of printing, and often signs his or her prints by hand. Prints tend to be smaller in scale than paintings – unless you’re looking at Modern and Contemporary works – and generally invite the close, intimate scrutiny that a smaller space engenders. This intimacy lends itself extremely well to adorning the walls of a regular-sized home. If you have a limited budget—who doesn’t these days?—you should consider prints. Because of their very nature, prints are less expensive than paintings. Prints are multiples, rather than one-of-a-kind works of art, so clearly they are less rare. This also means that condition is extremely important. In buying a unique work, if you absolutely love the image you may be more accepting of some minor condition problems. With prints, however, the rules change. 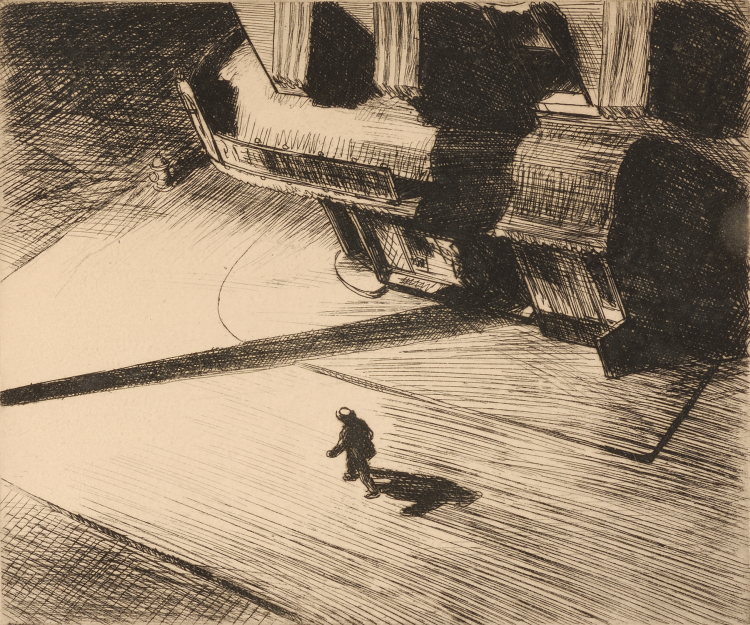 Consider an iconic etching like Edward Hopper’s Night Shadows of 1921. If that is the work you want, then you have options. This work was printed in an edition of 500. The very next one to come up at auction might be laid down or have trimmed margins or staining — all negative condition issues. If you’re willing to overlook those problems, you could get one of those 500 etchings for around $25,000 or less. Or, you can hold out for a fantastic impression in pristine condition for $40,000. The Hopper in poor condition may not be within your price range, but here’s another example: Let’s say you want to buy Thomas Hart Benton oil—just a minor one. Well, you need to be ready to spend $300,000 to $500,000. That’s the price of a house! It’s simply beyond most people’s budgets. And that doesn’t even address the cost of a prime example of his painting – his record for auction prices is just over $2.4 million. 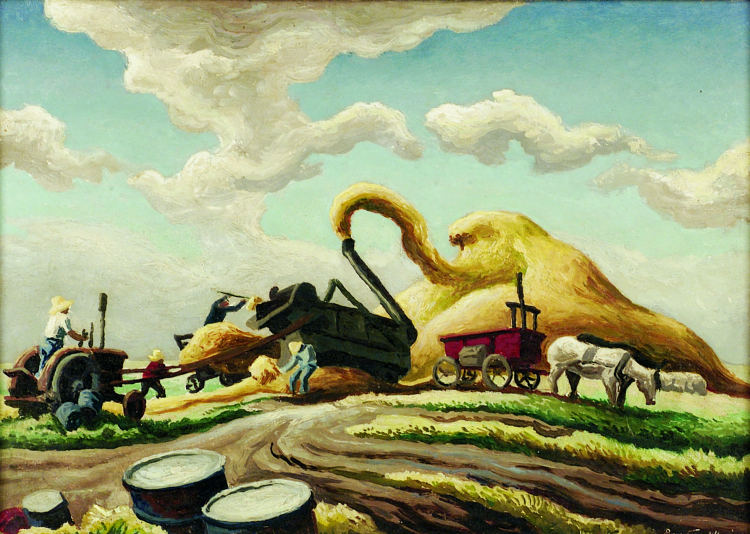 But, you can get a great Thomas Hart Benton lithograph—a quintessential example of his work—for $3,000 to $5,000. That’s not cheap, but it’s only a mortgage payment or two, and if you’re in love, what are a few mortgage payments? And since you’re wondering; for a major Hopper painting, plan to spend the price of the house, two new cars, plus 4 years of college tuition… or over $1,000,000. Suddenly $25,000-40,000 seems like a bargain. So, should you collect prints or paintings? It’s a few mortgage payments versus the whole house. You make the call! View the Fine Paintings & Sculpture or the Fine Prints & Photography catalog for our May 6, 2014 auction. Originally published November 23, 2010. Revised and updated January 13, 2012. This entry was posted in Blog and tagged Art & Antiques, art collecting, Collecting Tips, Edward Hopper, etching, etchings, Fine Paintings, Fine Prints, lithograph, oil painting, prints, prints or paintings, robin starr, thomas hart benton by Robin Starr. Bookmark the permalink. There are contemporys of Benton (and other WPA artists) that are Museum collected and under a thousand dollars, such as Charles Turzak ( recently exhibited at the Polasek Museum) and Grady Kimsey currnetly at the Mennello Museum of American Art). There is great timeless art at any budget. Get to know a local gallerist who can direct you to regional quality art that has a national presence. Absolutely true! There are all sorts of print makers whose work is of great importance, but whose prices are very reasonable. Turzak is a perfect example. Or consider the artists published by Associated American Artists. Galleries and auction houses can be wonderful resources for collectors at all levels. An ideal compromise for those who would like to collect original 19C American masterpieces instead of prints, and without breaking the bank, is to focus on miniature portraits, where $3000-$10000 can buy miniatures of great quality which are individually unique art works. These are often by artists whose original works are held in major museum collections, such as the Met and the Smithsonian. Many auction houses are unable to pick the artists for miniatures offered and hence there is scope to pick up bargains, if one is prepared to put in time and study the subject. The link takes one to a report of a number of recent sales of miniatures by Nathaniel Rogers which were unrecognized by the auction houses concerned. Great suggestion – miniatures are a great way to go! They also have other aspects in common with prints. Given their small scales (modern and contemporary prints aside), they are objects that demand close one-on-one study. They do not have the wow factor of a huge, room-changing painting. If the relationship between a viewer and a large painting is theater, the relationship with both prints and miniatures is a tête-à-tête. And because both collecting areas are slightly esoteric, there are great finds still to be discovered at there. This is a broad suggestion, but correct, IMHO. Thanks so much for you input. Sometimes that is certainly true – art auctions on cruise ships immediately spring to mind! Unfortunately collecting names rather than art is common in the print world and the painting world. It is a trend that increases exponentially every time the art market heats up. One of the few silver linings to market crashes is that they tends to cull out the collectors who are going after names. The beauty of a Rembrandt print (a period impression; not a brand new re-strike!) with its soft burr and almost calligraphic lines that create dramatic highlights and shadows is an intimate experience that one contemplates closely. Its impact is personal and certainly not the sort of thing that a name collector will appreciate. You are absolutely right: collecting for the love of the art, regardless of what you collect, is the right way to collect. Posers looking for status symbols need not apply! Your collecting habits should reflect YOUR personality and tastes. One kind of person might specialize and, for example, only collect prints from a certain period or a select group of artists. On the other hand, someone like me who is impulsive, undisciplined and scatter-brained, will have a collection that is all over the place. I love it that way..its me. Most people will advise you to collect like they do. Ignore them; do your own thing. I agree! An eclectic collection can be the best kind, because it speaks of the loves (and hates) of the individual. I tend towards prints due to budgetary constraints, but that certainly doesn’t mean I don’t buy paintings or decorative arts. The only collecting rule I espouse is, “Collect what you love.” Don’t stop being you. Thanks for the wonderful comments and advice. I have unabashedly been collecting prints and etchings for years and although not one-of-a-kind they are surely limited editions. considering that only 500 or so have been printed, and have been distributed and made available around the world, they therefore become somewhat unique. This is collecting art for the inspiration that true art can give not for showing off or making impressions. Here are many opportunites to collect works from the 14th century going forward for a mere few hundred dollars to a few thousand. The investments are well worth the satisfaction that one can have for many years. Henry: Collecting is an addiction (and one that we apparently share). While I have a few “names” in my collection, many of my favorites are the little-known artist who just happened to have created an image that moves me. You are correct – it isn’t about showing off; it’s about living with things that speak to you. The investment is returned to the collector ten-fold simply through the joy that the works bring each time one stops to admire them. Keep collecting! Art Collecting On a Budget | Skinner Inc.
Luke: I’m glad you enjoyed it!